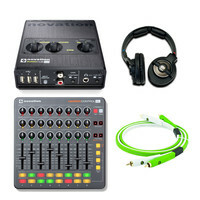 The Novation Audiohub DJ and Producer bundle is perfect for artists that want a professional but portable setup for live production and DJing. The Novation Audiohub 2×4 is a USB audio interface with Focusrite sound inside for high-quality electronic music production. Housed in a sleek yet tough aluminium chassis it provides two ultra-low latency inputs and four super loud outputs. This is paired with the Novation Launch Control XL which can easily take care of all your MIDI control and is powered from the Audiohub. To finish off the bundle we have included a pair of KRK KNS6400 Headphones and NEO high quality RCA cable. This entry was posted in Novation and tagged Recording-and-Computers. Bookmark the permalink.